Since 1994, Starr Exteriors & Outdoor Living has provided the DFW area with excellent service, we have become a premier choice for your outdoor living needs. Our customers have known that honesty, integrity, and quality workmanship still exist. Starr Outdoor Living provides an excellent and affordable solution for your outdoor living dreams. We specialize in custom cedar arbors, cabanas, fencing, Specializing in custom patios, decks, arbors, patio covers, stamped concrete, lighting, outdoor kitchens, and fireplaces. An outdoor fireplace or fire pit offers perfect ambiance or warmth on a chilly evening. 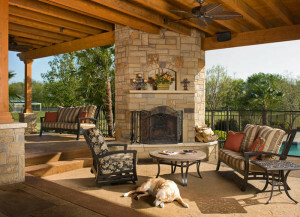 Let Starr Outdoor Living turn your backyard into your ideal outdoor living space. We have the best master craftsman on our staff who create and build the most unique designs in the metroplex. We have been in business for over 20+ Years and have an A+ Accredited Rating with the BBB. With proper care and maintenance, Starr Outdoor Living guarantees you will never have to replace a costly investment again. Starr Outdoor Living strives for excellence in every aspect of the job, from sales to the cleaning process and the final sealant process. The only way to guarantee excellence is to be on every job.